The Legend of Boggy Creek was inspired by eyewitness reports of a sasquatch-like creature said to live in the rugged bottomlands near the small town of Fouke in southwest Arkansas. The "Fouke Monster" - or "Boggy Creek Monster" as it came to be called - came to the attention of locals when it was sighted several times in the 1960s. In May of 1971, a family was reportedly attacked at their rural home which sent one of them to the Texarkana Hospital with injuries. This incident came to the attention of local news reporters who published the story in the Texarkana Gazette newspaper. The resulting attention brought forth other witnesses and eventually inspired Charles Pierce to build a movie idea around the story of the Fouke Monster. Over the years, sightings of the creature have been reported by countless people, including respected citizens, experienced hunters, famous musicians, and even a police officer. The release and ultimate success of The Legend of Boggy Creek brought the creature to worldwide fame, but sighting reports did not stop in the 1970s. Near the small town of Fouke, southeast of Texarkana, people are still reporting encounters with this mysterious creature even today. The definitive guide to the Boggy Creek Monster by author and Boggy Creek historian, Lyle Blackburn. 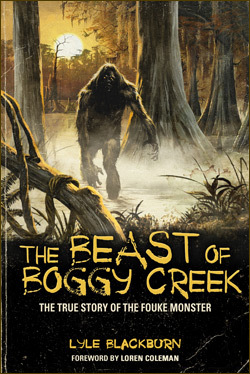 The book covers the history of the Fouke Monster and the making of The Legend of Boggy Creek movie. The book also includes a sighting chronicle with over 70 visual encounters near Fouke, Arkansas. It also contains a breakdown of all Legend of Boggy Creek scenes, tracing them back to the actual sightings on which they were based!